News | Watch Rachel Maddow bring MARCH: BOOK TWO to life with Lewis, Aydin, and Powell! 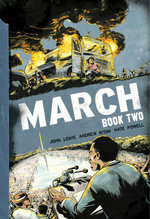 Watch Rachel Maddow bring MARCH: BOOK TWO to life with Lewis, Aydin, and Powell! The award-winning creators behind the landmark March series returned triumphantly to The Rachel Maddow Show last week to promote March: Book Two, as Maddow brought their work to life with a stunning blend of archival footage, animated art from the book, and live studio interviews. Congressman John Lewis, Andrew Aydin, and Nate Powell had fond memories of the show, having appeared together once before in November 2013 for March: Book One. But nothing could have prepared them for the amazing segment that awaited. After setting the stage with a recap of Gandhi's techniques of nonviolent activism, Maddow discussed the implementation of those techniques by Lewis and his allies in the civil rights movement. 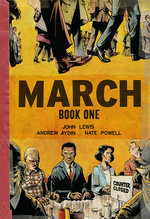 She recapped March: Book One and then walked viewers through key moments from March: Book Two, including the terrifying violence unleashed by the 1961 Freedom Rides and the backstage disputes about Lewis's electrifying speech at the 1963 March on Washington. Maddow then spoke with all three creators of March, discussing the widespread adoption of the series by schools, libraries, and awards, the responsibility the authors feel to be candid, and the reaction from young readers whose passion for civil rights is ignited after reading it. Both books continue to ride the New York Times bestseller list for Graphic Books, and also for the first time landed on the Times' monthly list for Race & Civil Rights bestsellers. Watch the segment now and grab your copy today!